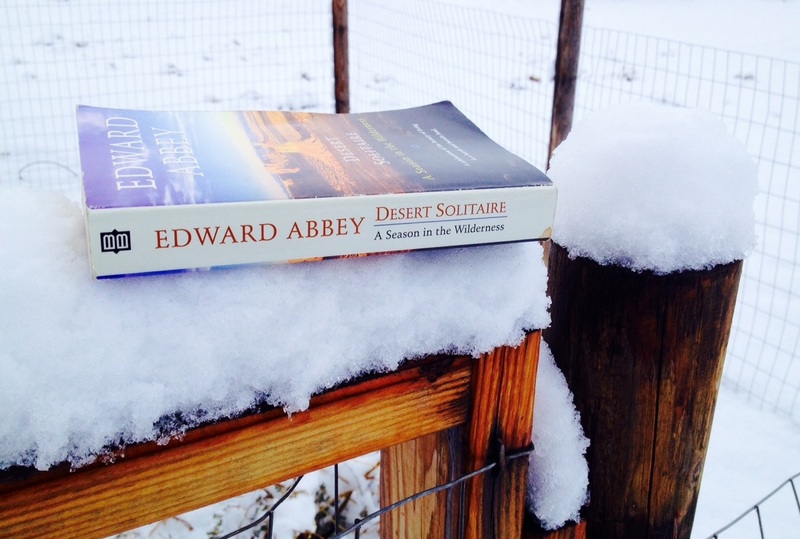 It was Edward Abbey’s birthday two days ago. I don’t typically make a big deal out of passed celebrity’s birthdays, but this seemed like a good one to talk about. I’m an Abbey fan, but not necessarily for his books, and while I know Abbey has a cult-like following, I am not a groupie. Sometimes an author writes in a such a way that their presence is a stronger force than the story they tell. This doesn’t happen to me often, but when it does, I am led to learn about the author, often more than I am led to read more of their literature, and this is true of Abbey. That being said, though not overly impressed with his books, I am interested in Edward Abbey, the man. Edward Abbey is a personality, and like him or not, that’s what you get in his books – and though I never knew the man, I think I would like the guy I meet there. What I like about Abbey is that he seemed to live true to who he was, he came across as honest, perhaps brutally so. He never struck me as a poser, a fake, or someone who hides behind platitudes, niceties, or flattery. I tend to like that in people, and while I am definitely drawn to nice people and don’t intentionally seek out the insulting ones, I do like knowing where people stand. I like genuine and he seemed genuine. But mostly I love his poignant thoughts, insights, and descriptions of the west, the desert, and the people found there. I quote him regularly. And last, anyone who can make me laugh is good in my book. Edward Abbey is synonymous in my mind with Moab and the desert landscape surrounding it. He is a self-proclaimed desert rat and his descriptions of the western desert are some of the best. Being one myself, I enjoy his experiences and can relate. In celebration of his life I wanted to share my favorite passage from Desert Solitaire. What I like about it is the unique juxtaposition of his personality with nature, the compromises he makes, the imposition of his principles in the context of reality, and the dichotomy of nature as beautiful and dangerous. I will try to cut parts that are not necessary to get the point of the story across. If you have read Desert Solitaire you will remember this part. Perhaps it made you laugh the way I did. Perhaps you are a coffee drinker and you understand the conundrum he found himself in the way that only a coffee drinker would. If this is your first read of Abbey, I hope you enjoy it as much as I did. Feel free to share your thoughts on Abbey and your favorite quotes. “As I mentioned before, I share the horsetrailer with a number of mice. They don’t disturb me and are welcome to my crumbs and leavings. My only reservation concerning the mice is that they do attract rattlesnakes. I’m sitting on my doorstep early one morning, facing the sun as usual, drinking coffee, when I happen to look down and see almost between my bare feet, only a couple of inches to the rear of my heels, the very thing I had in mind. He’s in the doorstep and in the shade where the ground and air remain very cold. In his sluggish condition he’s not likely to strike unless I rouse him by some careless move of my own. There’s a revolver inside the trailer, a huge British Webley .45, loaded, but it’s out of reach. Even if I had it in my hands I’d hesitate to blast a fellow creature at such close range, shooting between my own legs at a living target flat on the solid rock thirty inches away. It would be like murder; and where would I set my coffee? My cherry-wood walking stick leans against the trailerhouse wall only a few feet away but I’m afraid that in leaning over for it I might stir up the rattler or spill some hot coffee on his scales. Other considerations come to mind. It is my duty as a park ranger to protect, preserve, and defend all living things within the park boundaries, making no exceptions. Even if this were not the case I have personal convictions to uphold. Ideals, you might say. I prefer not to kill animals. I’m a humanist; I’d rather kill a man than a snake. What to do. I drink some more coffee and study the dormant reptile at my heels. It is not after all the mighty diamondback I’m confronted with but a smaller species known as the Faded Midget. An insulting name for a rattlesnake, which may explain the Faded Midget’s alleged bad temper. His bite, though temporarily disabling, would not likely kill a grown man in normal health. Even so I don’t really want him around. Am I to be compelled to put on boots or shoes every time I wish to step outside? I finish my coffee, lean back and swing my feet up and inside the doorway of the trailer. At once there is a buzzing sound from below and the rattler lifts his head from his coils, eyes brightening, and extends his narrow black tongue to test the air. After thawing out my boots over the gas flame I pull them on and come back to the doorway. My visitor is still waiting beneath the doorstep, basking in the sun, fully alert. The trailerhouse has two doors. I leave by the other and get a long-handled spade out of the bed of the government pickup. With this tool I scoop up the snake into the open. He strikes; I can hear the click of fangs against steel, see the strain of venom. I insist on herding him well away from the trailer. Posted on January 31, 2014, in Profiles of the Southwest and tagged birthday, coffee, Desert Solitaire, Edward Abbey, Moab, rattlesnake. Bookmark the permalink. Leave a comment.